You can now add balconies to your houses! Check out my Adding Balconies post explaining how to add and customise your balconies! STARTING THE BASEMENT OF KINGS QUEST: you will find Bree at the park 24 hours after you complete the balcony quest! I selected listen on Grim rather than chat now I can’t cancel this, help! Court another sim is stuck. And not in the normal way. So my 2 sims Kathy and ruby, Kathy was the one onnthe balcony. The action completed, but its stuck. Kathy keeps doing the admiring action and it cant be sped up. Ruby can still walk around and stuff. Could you send them both home using the simtracker? Hey this is what I tried. First I sent the other sim involved in the courting sim task back to his house and then the stuck sim was back to normal. Ok so I’m pretty sure this is a glitch but has anyone else had this problem? My sims just finished the task Court Another Sim and now one of my sims is just standing on the balcony doing the action of admiring something… But nothing is there. I tried turning of my device and exiting the house but nothing works. Can you help me? If not, could you give me direct steps to contact EA because I’ve tried to contact them before and they never do anything. Please help me!!!!!!!! 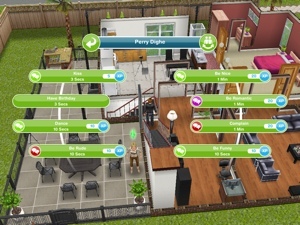 Unfortunately this is a technical issue so only EA will be able to fix it for you to contact them you need to go to this website: https://help.firemonkeys.com.au/hc/en-us/requests/new click on the sims freeplay then click on technical support and then a form will appear for you to fill in (your player ID can be found in the game in settings under about) once you have completed the form they will get back to you by emailing you as soon as they can. heyy the grim reaper is missing and i don’t know where he is. please help thanks. He should be at the diy house, try restarting your device, hopefully he will reappear. There isn’t a quest for outdoor staircases but if you complete the basement of kings quest you can build a basement then place stairs outside to get to it. A quick question: I don’t have the privacy screens; what are the measurements for them? (1 x 3?) Thanks! Im having a problem with the balconies quest. You hneed two sims yo make out on th couch in the diy basement. one sim starts this and the other cant join. What has gone wrong? Have you tried sending another sim? hi, I can’t find the Grim. I restarted my device but I can’t find him. I have 2 adults at the diy house. I wanted to submit a ticket to firemonkeys but I don’t know where to find my game id or any of that jazz. Please help! You will need to contact EA about this issue to see if they can fix this for you as I am unable to fix technical issues, sorry! In “Wrap things up”, why does the picture here says that it takes 15mins, when the post says 9hrs30mins? Because when I first completed this quest it was 15 minutes (that was when I took the picture) I haven’t completed it again since so I have updated the times when I have told they have changed but I cannot change the pictures without redoing it. The times are written for a reason, the pictures are only to show you the items I use, not the times. Hello, i have a question. On the Balcony quest i haven’t got it yet. I’m actually almost on lvl 42 and i still have not received it. I did the 2nd floor quest I think 2 weeks ago and haven’t received that quest or the basement, what is the problem? You need to find Bree in the park to start this quest like it says in this post, it does not start automatically. 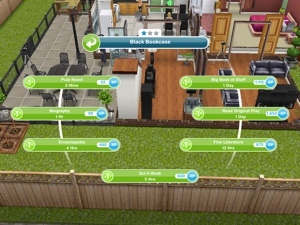 I have the “Court another sim” glitch that leaves my sims frozen, but I am not able to send my sim that is stuck home from the sim tracker, as it shows that sim as doing an action on the sim tracker. That sim also starts doing quest actions my other sims are doing, while still being stuck in the admiring position. I’m not really sure how to fix it or if I should contact someone. Suggestions? Can you click on them and speed up the actions with an LP? Have you tried sending the other sim who was doing that task home? Got thru balcony quest up to hiding behind bed. Did that, and now am supposed to speak to the Grim Reaper, but he is nowhere to be found. How do I find him? He should appear at the DIY house, try restarting your device and go back to the DIY house, hopefully he will turn up. When you get the privacy screens can you put them inside? I’ve seen some indoors before. No, they can only go outside. Hi! Are there any actions that can be started early while doing previous actions like in previous quests? Some of them seem pretty lengthy and I’d like to start them earlier to finish on time. No, if they could be started early it would say next to the task on the post that they can. Hi. Does a two-story house boat fulfill the criteria for a two-story home? Are you able to build a balcony on them? TIA. Firstly, your blog is so helpful and I love it💖. So I just wanted to let you know that in order to start this quest now, the requirement is to “Build a 2nd floor on any house”. Do you think that if we, for example, get the haunted house (which already has multiple stories), that requirement will be met? Thanks! The haunted house only has one floor though but if you buy a house with two stories then this will meet the requirement. I’m at the step where I have to read the original play on the diy homes bookshelf. Can I read it from my own 3 star bookshelf at home or do I HAVE to use the one at the diy house for the task to complete? If the option is on a bookshelf at home then you should be able to do it there. So I’m building my first balcony, and I want to have more than one tile design on the same balcony. How do I add different tile designs to the same balcony? Thanks. Can I know what actually event to do for Tropical Romance Island Event, I’ve playing for a long time but still can’t do that quest. Anything wrong? Which event actually? Or I must download something to do the quest, I’ve update it for the latest version. The tropical romance island event is not currently available, you will need to wait until they bring back this event if they ever do before you will be able to do it. The styles of time quest is a limited time quest so it will start at the same time for everyone with the latest update and end at the same time so if you miss this time then you won’t be able to complete it until they add it to the game again unfortunately! 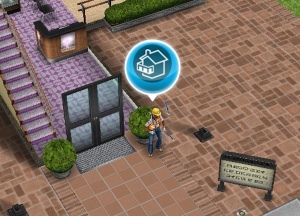 Hi after all is done at the DIY HOUSE does your sim get to keep the DIY HOUSE ????? 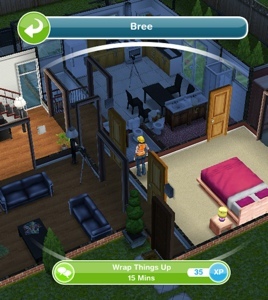 If you complete the basement quest in the time limit you unlock the DIY house to build in your simtown. Are you currently on another discovery quest? You can only do one at a time. I cannot find “Watch a DIY Homes Marathon” on the TV. Do you have a possible reason? Are you on that goal yet? Yes. I am stuck on the goal however. Are you using an adult sim? I comforted the Grim but the task won’t complete. I’ve tried sending everyone home and brought them all back to DIY house. Any tips? Have you tried to comfort him again? Thank you for all your help and the detailed info. I really appreciate all your hard work. Can you have sims that are strangers do this quest? Planning to start this but I want to win the house. Hey, I wanna ask about the quest balcony, why I’m not have the quest. I’m in level 22 now. And when I go to park, the bree not there? 😦 I’ve done quest patios. But not with balcony quest. Have you only just finished the patio quest? If so it can take a while for Bree to show, just keep checking back at the park. So I did my last task (leave the diy home) but it still says to leave even though they’re all gone already and idk what to do…I feel like it was bc I left the home before my sims did and I can’r call the cab over a phone anymore either…what happened? 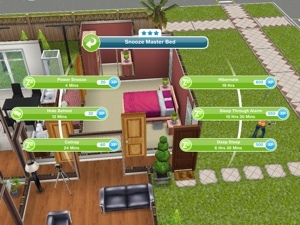 Try having all your sims not doing anything, this sometimes works to make the game realise you have completed that task. I can’t have my sims kiss. I’ve tried everything and it’s not working. What do I do? Are they definitely two adult sims? Try sending those sims home and send two sims back and try again. To ‘wrap things up with bree’ is it 9hours 30 minutes or 15 minuets ?? 9 hours 30 minutes like it says in the post, the quest has been updated since I completed the quest and created the post so I haven’t been able to get a new screenshot but the writing in the post is up to date, the picture is just to show you what to do to complete that task. How long does it take to do this quest? Can you not click to cancel this option? Or wait until they finish then pick the correct option? I am in a pickle. I need to chat with Grim, but my curiosity got the best of me. I had a sim “listen” to Grim just to see what it was. There was no time limit on it which I should’ve paid more attention to. Anyway, the sim that’s listening is frozen and my other sims can’t chat with Grim. Please help!!! 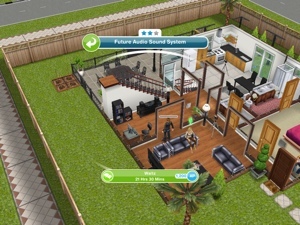 That sims to stop “listening.” Thanks. Thank you for the suggestion. I just closed the app and went to another app for about twenty minutes, and when I went back they weren’t “listening” anymore. Your blogs are so helpful by the way. Thanks so much. You make Sims a lot easier. I’m glad its fixed and you’re welcome! I had to chat with the grim but i wanted to see what’ll happen if i click “listen”, so i did and neither the sim or the grim are moving! what should i do? There is currently a glitch with stairs which hopefully will be fixed in a few days. The makers have released a fix for this, you will need to go to the app store where you downloaded the game from, go to updates or search for the sims freeplay and then click update then you will be able to use the stairs to complete this quest. 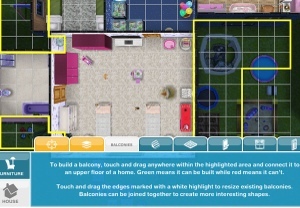 Hi I am doing the lovey dovey balcony quest and my Sian’s are at the DIY home. I’m onto the task we’re you have to “make out with a sim” but my sims won’t go down stairs into the basement, when I click the “make out couch” it has the symbol (the symbol that means the sim can’t go because something is in the way) but there is nothing in the way. Please help me I have 6 days to complete this quest!!!!! !